We are bombarded with information - press releases, television news, internet websites, and office memos, just to name a few - on a daily basis. However, the important conclusions that may or need to be inferred from such information are typically not provided. We must draw the conclusions by ourselves. How do we draw these conclusions? This 2004 book addresses how we reason to reach sensible conclusions. The purpose of this book is to organise in one volume what is known about reasoning, such as its structural prerequisites, its mechanisms, its susceptibility to pragmatic influences, its pitfalls, and the bases for its development. Given that reasoning underlies so many of our intellectual activities - when we learn, criticise, analyse, judge, infer, evaluate, optimise, apply, discover, imagine, devise, and create - we stand to gain a great deal if we can learn to define, operate, apply, and nurture our reasoning. 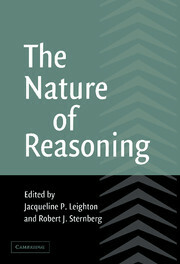 16 - What do We Know about the Nature of Reasoning?